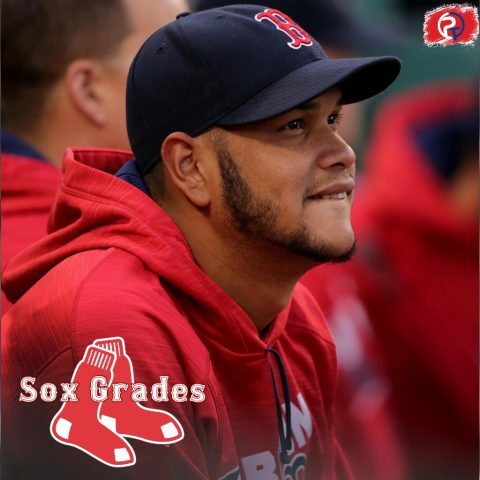 This version of “Sox Grades” continues with the rotation but focuses on the back part of it. These were the players that stepped up in place of some of the other starters and provided key innings for the Sox down the stretch in place of guys like Chris Sale. One player even got so far as the start a game in the World Series, but did it have an effect on his grade? Let’s see what our analysts thought. Jeremy: Eduardo Rodriguez is the new version of Clay Buchholz. Filthy when healthy, but a freak injury always seems to derail his season. This season was no different. Rodriguez sprained his ankle and was never the same. He was supposed to be an important piece of the playoff pen, but the lefty couldn’t garner confidence with Alex Cora and was banished to mop up duty until Game 4 of the World Series. He battled well, and the Sox won, so I guess it was the right move. But Rodriguez did himself no favors. When will he take the next step? When that step isn’t in a walking boot. Jordan: If it weren’t for how Game 3 ended, I would’ve felt worse for Rodriguez than I did for Eovaldi. Talk about a guy who gave you everything he had, perhaps even more than what he had. He was put in the doghouse for Alex Cora after his ALDS performance and was basically left to close out blowouts. Everyone other than he and Pomeranz was used in Game 3, so naturally, I thought maybe Cora would go to Pomeranz. In fact, at the time I wanted Pomeranz to start. But he didn’t and Rodriguez was amazing. The one issue for him again in the regular season was the injuries. He started the year on the shelf, and proceeded to get hurt again before the All-Star Break –– then didn’t return until September. That’s really annoying because he looked awesome before getting hurt. Jeremy: Honestly, I am pretty satisfied with Hector Velazquez’s season. He wasn’t brought in to light to the world on fire, just to be a stopgap while starters were shelved. He performed well, and for some reason won a lot of games. I mean, there really isn’t much more to say; he was just average. Jordan: Like Jeremy said, I am nothing but satisfied with what Hector Velasquez put out in the 2018 season for the Red Sox. He was by no means amazing; but rather just a strong season. No part of his game strikes you as proficient. When he was a starter, he pretty much went four or five innings, and then wasn’t in a pivotal bullpen role when he wasn’t in the rotation. Jeremy: See- Hector Velazquez. No seriously though, these two were almost carbon copies of one another, just pitching with opposite arms. Johnson ate up innings well and was able to strike out guys more effectively than Velazquez. However, the decision to keep both of them off the postseason roster was really a no-brainer. Congrats on your rings boys. Jordan: In my opinion, Brian Johnson was much more trusted than Velasquez last year. For what reason exactly, I am not so sure. All I know is his ERA is inflated from starts where Cora left him in far too long, and he got visibly tired to the point where he’d get beaten by the gopher ball. But, like Velasquez, he wasn’t a world-beater by any means. He was “good enough” most of the time.